Elevated or raised dog beds are increasingly popular among pet parents who are looking for a dog bed with exceptional durability, comfort, and protection from the cold or hot and dirty floor. But you have to beware as there are plenty of knockoffs in the market promising you heaven when it comes to durability, strength, and comfort yet fail miserably in their delivery. To help you avoid such traps we’re sharing with you the 5 best-raised dog beds we’ve researched on with the help of pet parents like you, our friends in the veterinary profession, and our experts in the field. Gale Pacific is especially known for creating a variety of dog beds that are precision-crafted for superior strength and durability without sacrificing doggie comfort and safety. Its Coolaroo Elevated Pet Bed with Knitted Fabric is one of the most loved raised dog beds on the planet primarily because of its reliably sturdy steel frame that has been finished in powder black coating. The coating is a requirement as it provides a slippery surface for insects, critters, and organisms like fleas, mites, mildew, and mold from ever reaching the sleeping surface located some 7 inches off the ground. All materials used in the design and construction of the Coolaroo are guaranteed to be completely safe and free from any chemical that might harm your dog or any other pet that might want to use the bed for cooling or even for warming purposes. And with a really friendly price that is less than three Alexander Hamiltons. 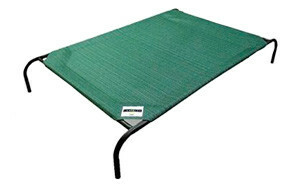 One of the most trusted names in pet accessories especially beds is K&H Pet Products. They’ve got toys, beddings, travel products, and a whole lot more for your dog, cat, poultry, and even exotic pets. 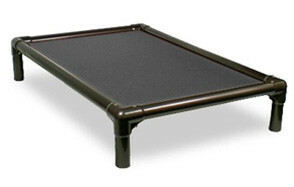 You can always rely on K&H to deliver exceptionally high-quality products like their Original Pet Elevated Pet Bed that is constructed of super-durable yet ultra-comfortable 600-denier fabric material. The same material is treated with superior waterproofing technology so it is perfect for both indoor and outdoor use. You can also add a few other accessories like canopy, self-warming pet cot, cooling pet cot, and even replacement covers. Sadly you’d have to purchase these separately. The K&H Original comes with a mesh panel center which is guaranteed to repel mold and mildew while also protecting against moisture buildup and odor-causing bacteria. The only downside is that you’d have to shell out a Ulysses Grant to get one for your dog. Looking at AmazonBasics’ entry into our list of the 5 best raised dog beds, one cannot deny its very striking resemblance with the Coolaroo. From the design of the frame right down to the color of the sleeping surface and even the price tag at less than $30, the AmazonBasics Elevated Cooling Bed has definitely a lot of similarities with the Gale Pacific Coolaroo. It is also very easy to clean, maintain, and very easy to assemble, requiring only a few tools that are already included in the package. The mesh fabric material is super strong and very easy to clean as it can be thrown right into your washing machine. If not you can simply hose it down for that instant clean. The AmazonBasics also comes with a maximum weight limit of 150 pounds, but this is for its large version. Perhaps the good news here is that you’re covered by Amazon’s reputation. Unlike the other 4 raised dog beds in this list, Kuranda’s Chewproof Dog Bed is unique for a number of reasons. First, it is the only one that uses high-strength, durable PVC in the construction of its frame instead of the more conventional metal or steel. Second, its sleeping surface is constructed of Cordura, a brand of fabric that is well-known for its resistance against scuffs, tears, and abrasions giving the Kuranda an amazing chew-proof and scratch-proof design. Third, the sleeping surface is also designed to be exceptionally flexible, minimizing the application of pressure on the bony prominences on your dog’s body. Fourth, it is designed specifically for indoor use. If you need something for the outdoors, you’d better get the aluminum variant. Lastly, the Kuranda is quite expensive costing you 3 Coolaroos or 3 AmazonBasics elevated dog beds or about two K&H Originals. On the bright side, it’s tough and very easy to clean and should be a great addition to any room in your home. For the price of less than an Andrew Jackson bill, you can already give your pet the Paws & Pals OxGord Travel Gear Approved Portable Elevated Bed. 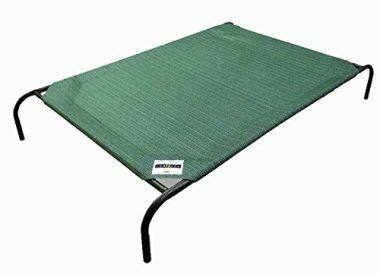 The OxGord is one of the best raised dog beds especially for folks who are looking for a more practical approach to cooling or even warming their pets in different times of the year. The only thing that you might not totally agree with Paws & Pals is that it has a maximum weight limit of 88 pounds for its large variant. Other brands of the same size category can take at least 100 pounds. Nevertheless, because of its compact design and easy-to-assemble and disassemble construction, this is the dog cot that you can bring anywhere with you so your pet will have the most comfortable rest in its existence. The Paws & Pals can be easily cleaned with a simple wipe, too. If you have a below 88-pound dog and you don’t want to spend more than an Andrew Jackson bill, the Paws & Pals is an awesome choice. Whenever you want to buy something for your pet there are a few considerations that you really have to think about. The same is true with buying the best raised dog bed for your pet. Our buying guide should help you make that decision a lot better. 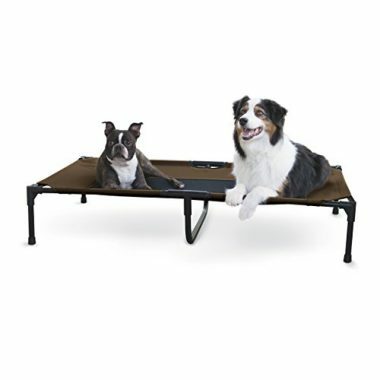 Why Should I Get a Raised Dog Bed? One of the most fundamental questions that pet parents have about raised dog beds is whether their pets really need one. This is especially true if their dog seems really comfortable in its plush and super-comfy pet bed. 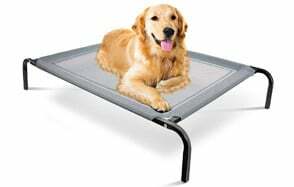 But there are actually many reasons why you may want to get your dog an elevated bed. Here are some of them. Different dog breeds have different thermoregulation needs. For example, dogs that are naturally bred for cold weather environments are very easy to overheat in hot environments especially in the summer. On the other hand, dogs that have very thin coats or those that are single-coated will typically feel very cold in a cold environment such as inside an air-conditioned room or during the winter. Elevated dog beds help both kinds of dogs by facilitating the movement of air. When it is super hot outside, the space between the ground surface and the sleeping surface of raised dog beds allow for greater circulation of air. This has a cooling effect on your dog so they don’t overheat. Likewise, when it is too cold, the elevated platform moves the body of the dog away from the cold floor. This allows the dog to keep its warmth, preventing it from chilling. Elevated dog beds do not have stuffing or filling that needs to be protected by sewing fabric panels together. These seams are weak points in a dog bed, making it especially susceptible to chewing and utter destruction. 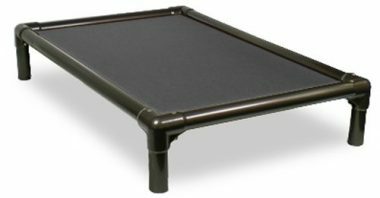 Elevated beds are virtually indestructible beds since their frames are mostly made up of metal, steel, or even high-strength PVC. The sleeping surfaces are also made of materials that are tough and durable and are proven to be less appealing to dogs to chew on. Since the sleeping surface is actually suspended on air it doesn’t cause undue pressure on the joints of your dog. While an orthopedic dog bed will serve the purpose, it doesn’t come with the cooling or warming capabilities of elevated dog beds. If senior dogs especially those with joint problems will use a standard dog bed, getting up and lying down will be especially difficult because of the distance that their joints will have to travel towards and from the floor. An elevated dog bed puts the joints only a bit higher than the sleeping surface, closing the gap between the bed and the joints making it easier for senior dogs to move in and out of their bed. Mold and mildew are known to grow in closed areas where there is very minimal airflow. These microorganisms can get in contact with your dog’s skin causing irritations and inflammation. Elevated dog beds can prevent such conditions from happening because of the open design of the sleeping surface. Additionally, the panel is made of mesh fabric guaranteeing excellent air circulation. Now that you know why an elevated dog bed can be great for your pet, it’s time to look at how you can pick the right one for your hound. Always measure the size of your dog to have an idea of the correct size of the elevated dog bed you’re going to get. To know the size of your dog, run a tape measure from your dog’s snout all the way to the base of its tail. This is the minimum size of dog bed that you will need in terms of its length. If you’re not sure, it is always better to get the next size. From the frame up to the sleeping area, the materials used should be tough and durable. Typical frame materials are made of steel or metal although some come with PVC. It is also important to look for reinforced or rounded corners as these can definitely increase the lifespan of the bed. The mesh fabric should also not extend into the corners to prevent your dog from latching onto it to chew. Mesh panels are a standard in elevated dog beds. However, for optimum breathability, you should always go for those with high-density polyethylene as this material is well-regarded for its ability to prevent hot spots while increasing overall comfort for your dog. Most raised dog beds are very easy to clean. Most only require hosing down while others with removable sleeping surfaces can be washed thoroughly in a washing machine. If you have to clean your dog bed it is important to use a cleaning agent that is safe for pets. 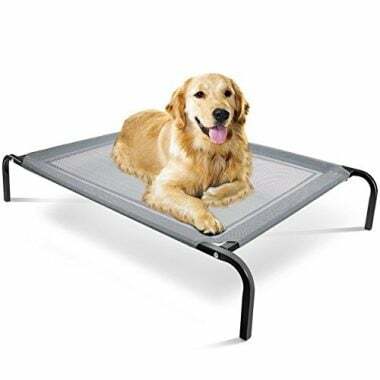 You may have bought the sturdiest, toughest, most comfortable, and most durable elevated dog bed in the market that is more than capable of accommodating your pet’s weight, but if you don’t train it on how to use it then you will still be seeing your dog sleeping on the floor or even cuddled up next to you on your bed. Like everything else in the dog world, training your dog to use an elevated bed requires perseverance, patience (lots of it), and consistency. You don’t want to issue a command one night and then use another the following night. Here’s how you can teach your dog to use an elevated bed. Always start by teaching your dog the “up” command. In teaching the “up” command, you can bring your pet at the foot of an object that has an elevated platform such as the first step on your stair or even an overturned box. The important thing to remember is to use a platform upon which your dog can be taught how to jump onto it. So the platform should be sturdy, stable, and be able to hold your dog’s weight. Issue the command “up”, show your dog a treat, and move it on the elevated platform. Your pet’s natural reaction will be to stand up on its two hind legs and try to reach for the treat with its nose. You’ll need to move the treat further away so that your dog will move its entire body onto the platform. Once it’s on the elevated platform, give the treat, and praise. You should repeat this over and over. What you want is for your dog to associate the word “up” to go on top of an elevated platform to receive its treat. All dogs should already be trained to respond to the “down” command. This is important since your dog will have to assume the down position in preparation for sleep. Once your dog has fully understood the meaning of the command “up”, you may want to start training it to respond to the command “bed” or “bedtime” or “night night”, whichever you want to use. The goal here is to teach your dog that it’s already time for bed. Using the same training technique of issuing the command, enticing your dog to follow the treat, and then giving your pet its treat if it accomplishes the task successfully, you can ensure that your dog will be going straight to bed on command. You can now start training your dog on how to properly use the elevated dog bed. First issue the “bed” or “night night” command. Your dog should go instantly at the foot of its bed. Give its treat and reward it with extra praises. Next issue the command “up”. Your dog should jump onto the bed, give its treat, and praise. Lastly, issue the “down” command. Your dog will now assume a sleeping position. Again be consistent in your training and always use positive reinforcement. Now practice. Elevated bed dogs may not have fancy designs or fluffy stuffing, but they sure can offer your dog the kind of comfort that will put to shame even the plushiest dog bed you can find. And with these 5 best raised dog beds we featured, you can bet your hound will be having the most comfortable sleep all-year round.